Retargeting—the delivery of ads to consumers based on their previous Internet actions—has become a mainstream marketing tactic and is growing fast, especially on the Facebook Exchange, according to a recent study by Chango and Digiday. The report, which was based on data from a survey of 300 media buyers located in the US, Canada, and the UK, found that one in five marketers now has a dedicated retargeting budget and more than half plan to increase their spend in 2014. Site retargeting—serving ads to users who visit a brand’s website but fail to convert—is the most popular type of retargeting, used by 86% of respondents, followed by search retargeting (75%). 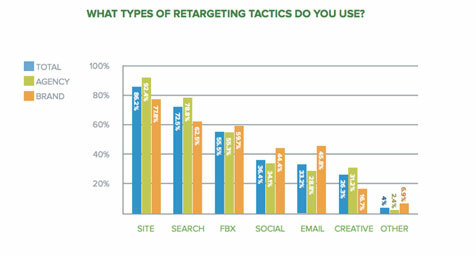 The report found that the Facebook Exchange (FBX) has quickly emerged as another top method for retargeting. In the last six months, use of the social network’s real-time bidding ad system by marketers has risen 15 percentage points, from 41% to 56%. This widespread adoption of FBX is striking given that Facebook launched the platform just over a year ago in September 2012. Next year the exchange should see continued growth, with 49% of buyers saying they expect to increase their FBX spend in 2014. Spend on other top retargeting tactics is also set to increase—52% of buyers expect to boost their site retargeting spend, and 48% say they will add to their search retargeting budget. This expected growth in spend indicates that media buyers see retargeting as an increasingly effective marketing channel. As you budget for 2014, make sure to include it as part of your mix, and plan for both traditional retargeting tactics and emerging platforms such as the Facebook Exchange. Use ad retargeting to refine your marketing strategy and increase sales. Contact MDG Advertising today at 561-338-7797, or visit mdgadvertising.com.